We’ve all been there: You awkwardly reach behind the dryer to retrieve a sock and are stopped in your tracks when you realize how dirty it is back there! How in the world are you going to clean behind the washer and dryer?! These heavy machines don’t just pull forward with ease. 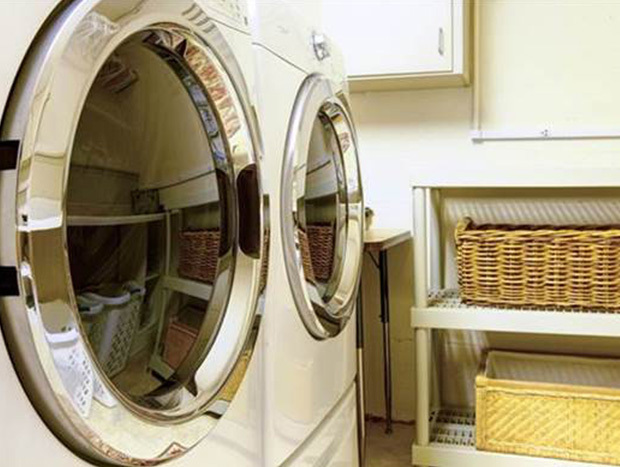 If you’ve never cleaned behind your washer and dryer, then you may be in for a big surprise. Lint, dust, and dirt love to collect in CLUMPS behind the dryer. You may even find spilled detergent behind the washer, which is a real treat if it’s mixed with dryer lint. A thorough cleaning behind the washer and dryer every few months will keep the area clean, and can prevent dryer fires and mold. To properly clean behind the washer and dryer, you’re going to have to pull the unit forward. This will make cleaning a lot easier, and will ensure you get a thorough wipe down of the back and sides of the appliances. However, moving a washer and dryer is not an easy task (especially if you don’t have much muscle strength). As you pull the unit forward, be careful not to scratch the floor. Appliance Glides will make it easier to slide the appliance forward and will protect your flooring from scratches and tears. Look familiar? Here’s how to clean that mess! Once the washer and dryer are pulled forward, the real work begins. Start by using a vacuum to remove dust and lint from the floor, walls, and appliances. We prefer a vacuum over a broom because vacuums are more efficient at removing dirt (and less likely to create a dust storm!). Once the area is completely clean of dust and lint, use a sponge or rag with your favorite cleaning solution to wipe the floor, walls, and appliances clean. Don’t forget to wipe down the outside of the washer and dryer. This is also a great time to remove any lint buildup from your dryer vent. Using the vacuum’s connector hose, remove as much lint from the dryer’s vent and the vent hose as possible. 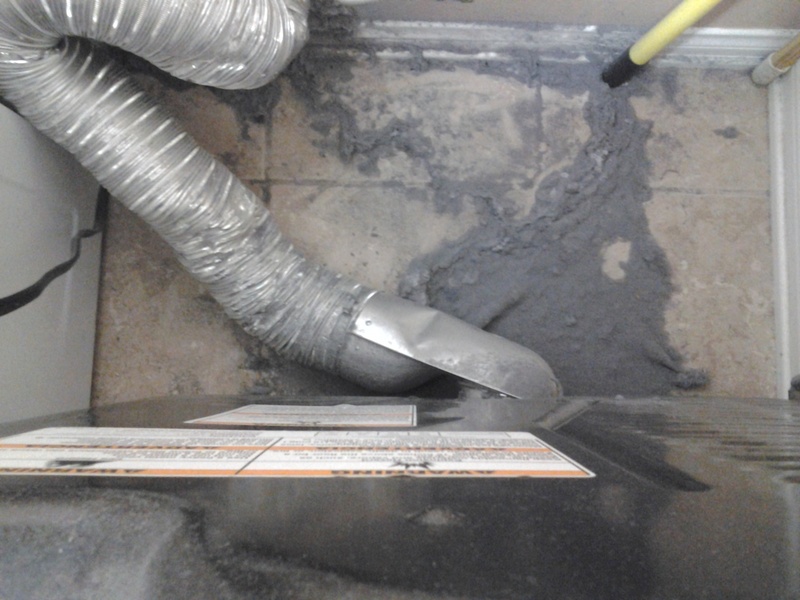 If it appears that the dryer vent has accumulated a lot of lint, it is a good idea to contact your local dryer vent cleaner for a professional vent cleaning (this will keep your machine in good working order and prevent house fires). Want to clean the vent on your own? Here is a helpful video with step by step instructions. Finally, slide your washer and dryer back in place. *Be sure to properly reconnect the hose before returning to the dryer to its position. As a final measure, wipe down the front and top of both machines. 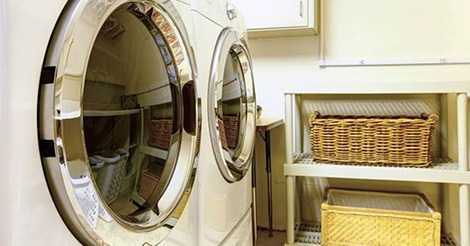 For a really clean laundry room, open the dryer door and wipe down the door boot and frame. Then, open the washer and wipe down the top and soap dish. Run a cleaning cycle for your washer using Affresh tabs or another washing machine cleaner.